Lalibela is a small town in the centre of what is administratively known as the Amhara division, Ethiopia. The latest census puts its population at 14,668 with 7049 males and 7619 females. It has grown immensely since the previous census was published in 1994-which had put the total population at 8484. Lalibela has a latitude and longitude of 12.04� N 39.04� E.
The name Lalibela derived from King Lalibela of the Zagew dynasty which ruled Ethiopia from the late12th to the 13th century. 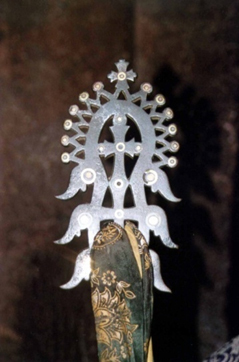 King Lalibela is credited with the foundation of the 11 rock-hewn churches in the 12th century. They are a lasting monument to man's faith in God and are the world's most incredible man-made creations. Most writers who visited the place describe these churches as the "eighth wonder of the world". These remarkable edifices were carved out of a solid rock, in a region where the ragged landscape still protects the churches from mass tourism. The churches are assembled in three groups, each with a name that reflects the devotion of the believers. Of these, the church of Medhane Alelm (Saviour of the World) is believed to be the largest monolithic church in the world. The reputed constructor of the churches, King Lalibela is said to have visited Jerusalem and, on his return, attempted to re-create a New Jerusalem. That was the reason why names in the town are biblical. For example, the town's river is known as Jordan. 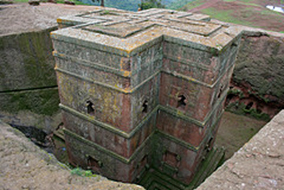 The Northern Group, Bete Medhane Alem, is home to the Lalibela Cross and believed to be the largest monolithic church in the world, probably a copy of St Mary of Zion in Aksum. The Western Group is Bete Giyorgis. It is said to be the most finely executed and best preserved church. The Eastern Group include Bete Amanuel (possibly the former royal chapel ), Bete Merkorios (which may be a former prison ), Bete Abba Libanos and Bete Gabriel-Rufael (possibly a former royal palace ), which is linked to a holy bakery .